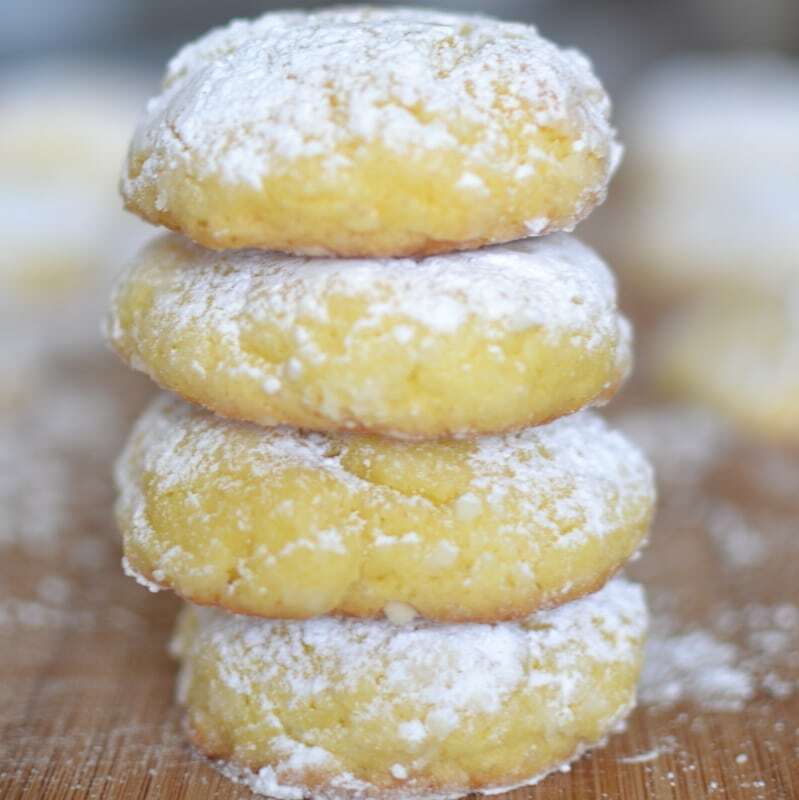 Seven ingredient buttery lemon cookies that melt in your mouth. Have you tried my gooey butter cake? This is the cookie version with a lemon twist. It is so difficult to stop eating these! 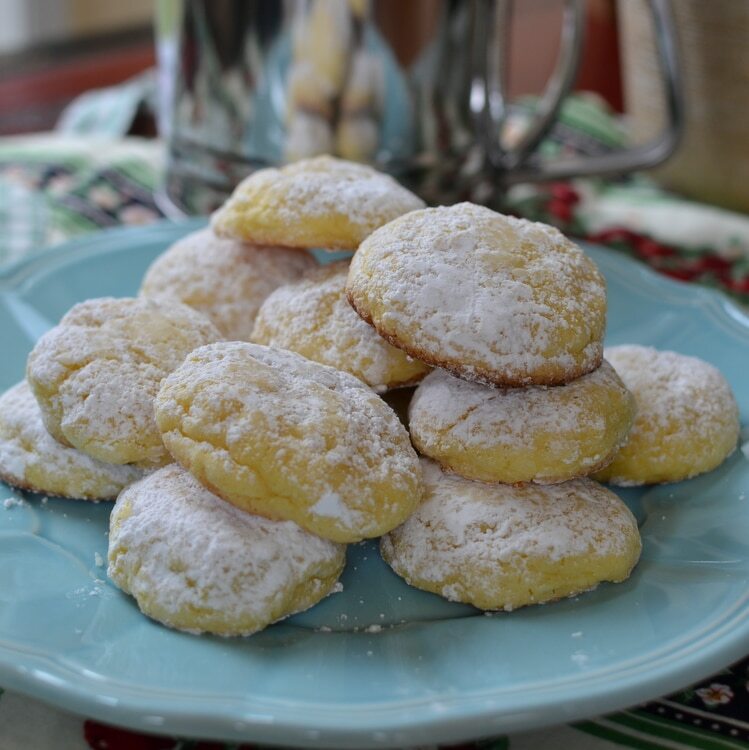 These Lemon Gooey Butter Cookies are easy, delicious and consistently great. This recipe has been pinned and commented on so many times that I thought I might add some reader recommendations. The consensus is a little more lemon juice and a little lemon zest so I am going to modify the recipe to reflect this!!! These cookies freeze well. Just remember to double wrap them in freezer bags and place them in a sturdy freezer container. When defrosting remove them from all wrapping and let defrost uncovered. The perfect cookie for that holiday party! Your company will love them. Cream butter and cream cheese with mixer. Add egg, lemon juice and lemon zest; mix until combined on low. Add the lemon cake mix in three parts mixing until combined after each part. Roll into 1 inch balls and roll through the powdered sugar. Place on cookie sheets covered with parchment paper. Bake 10-12 minutes at 350 degrees. Cool for two minutes and remove to cookie cooling racks. When fully cool dust with more powdered sugar. Do you just add the mix dry without any of the ingredients on the box? I made 40 using a small cookie scoop. Thanks so much for the heads up!! My families and church groups favorite cookies! Thank you for sharing. My pleasure. So glad that they like them!! Does it have to be butter or can margarine be substituted? This is one of those recipes that needs butter! I would not substitute on this one! Happy cooking! Believe it or not, butter is healthier than margarine. Yes I know and I love it! 1 stick or 1/2 cup butter is equal to 4 ounces, or 113 grams. Happy baking!! Could white chocolate chips be added to these cookies? You know it would create a much different cookie. If you try it I would go light on the white chocolate chips. Maybe try some with and some without. Let me know how it turns out. I will interested to hear. I think a drizzle of white chocolate after they are baked would be better. The texture is VERY soft and I think the chips wouldn’t work very well. I agree. I think the chips would weigh the cookie down. It is SO good the way it is. I think that you could but you are going to have to put some muscle into creaming the cream cheese and butter. Mix by hand until smooth and creamy. Do you have a hand mixer. It would work as well. I’m helping my friend bake cookies for a cookie table at her daughter’s wedding. We will be baking them far in advance of the wedding and freezing. Will these cookies freeze well? Flash freeze them on cookie sheets before stacking them in freezer containers. They are a delicate cookie. When defrosting I would open container, remove cookies and stack on cookie sheets again until defrosted so they do not sweat and stick together. Make sure they are in good sturdy containers that are sealed well. My 6 yr old daughter and I made these Yesterday, they came out perfect! They are beautiful and delicious. I did add a little bit of lemon zest just to add a bit of a pop. Thanks for sharing!! Can’t wait for my family to taste at dinner today. So glad that you like them! How does one store them? Must they be refridgerated? I found these to be delicious but they seemed to me to be just like a little piece of cake! Where was the gooey part?!? There is a coffee cake that is often made in the Midwest that we call Gooey Butter Cake. You can see mine right here: Anyway those cookies are a knock off from that coffee cake including many of the same ingredients. So it is more of a name thing! We are doing a Holiday cookie exchange in my office, do you think this cookie could be baked on a Popsicle stick? Or will it just fall out? I don’t think that cookie will hold up to a Popsicle stick. Sorry! Do I have to refridgerate? No you do not need to refrigerate them. Happy cooking! They get eaten too fast! Awesome!! I love it when the cookies are eaten fast! Can they be refrigerated overnight instead of for just 2 hours? Yes, just cover real well so the dough does not dry out. Happy cooking!! How much cake mix do you use? I’m from Germany and the weight of cake mix differs from brand to brand – and I guess from country to country. Greetings from St. Charles Missouri! I use 16.5 ounces of cake mix! Happy baking! How many did you get out of this recipes? I need a few dozen and wanted to make sure I bought enough cake mix and butter. This recipe makes between 24-30 cookies depending on depending on how large you roll your balls.Try to keep them to one inch and you will get closer to 30. I have also had several readers suggest a little more lemon juice and maybe a little lemon zest. Okay, this may sound stupid but do I add the cake mix in, in powder form? Or mix it like I’m making a cake? I’m going to try these. They look divine! Love anything lemon! 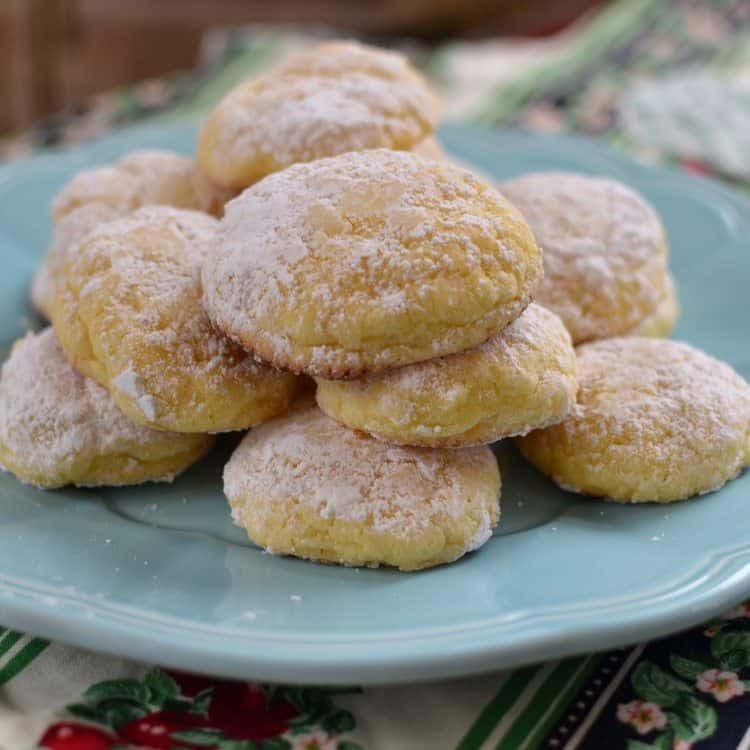 Made these but added powdered lemon to the powdered sugar for an extra punch of lemon. Yummy!! It’s crystallized lemon called True Lemon. I find it it baking items at my grocery store. By the Stevia. It comes in packets like sweetener but it does not contain sweetener. Only lemon. Thanks for the info. Appreciate it! Thank you. So glad to know about “true lemon”. Hope we have it here. My daughter has been making these for a few years. Her teenagers and their friends love them. They are delicious! 🙂 Your daughter has fine taste! Do you think this mix would be enough to fill a bar pan for bar cookies instead of individual cookies? The cookies didn’t bake even ! Don’t know why? But they’re very good!!!! Not sure what happened. Did you refrigerate the dough and roll them into balls? I’m in a hurry, does the dough have to be refrigerated for 2 hours?? Not if it is stiff enough to roll into balls. Making these right now for the second time this week. They are divine. Mom and boyfriend approved, as well. Thanks for the recipe and helping me score points in the kitchen! Glad you scored some points!!! You are most welcome! My pleasure! They sound wonderful and are in oven right now! Fantastic. Let me know what you think! Well let me see if I can help!! They have a light lemon and butter taste. They are not a heavy cookie. They are not chewy. They are more airy and melt in your mouth but not as airy as meringue. I hope I have helped. What does a stick of butter weigh? I’m in Australia, we don’t buy it in sticks. Thank you. Real butter is sold in stick form in Australia (I’m in Sydney). But the measurements are different. A “stick” of butter in Australia is 250g or a cup. Thanks for the heads up! A stick of butter in the United States is 1/2 cup. i need to know how many cookies this recipe yields. Need it asap please can you help me? Approximately 24 cookies. Happy Baking!! Can I use a stamp cookie cutter with these or will it just sticks to the stamp 🙂 my dad loves anything lemon but I’d love to use my new Halloween stamp ! I am not sure. I am sorry I have never used a cookie stamper. If you try and it works let me know because I will let the readers know. Yes I do! Happy baking! I’m sorry I’m confused. I asked which one u use? Salted? Unsalted? Which one? Can the dough be frozen for a later time? Thanks for the easy recipe! I just made a batch and although these are really YUMMY! I have one complaint – they didn’t last very long -LOL!!! I must double the recipe next time!! I think the dough would freeze very well and if rolled into a log between plastic wrap, it could then be sliced nicely with a sharp knife. I did add 2t lemon zest as well as 10 drops of YLEO Vitality Lemon Oil – Loved it!! Sorry to hear that they did not last!!! LOL! I think they would freeze well too!! Thanks for the recommendations. What is Vitality Lemon Oil? Vitality Lemon Oil is a line of highly concentrated essential oil from Young Living Essential Oils that naturally helps enhance the flavor of foods and water. Young Living offers a wide variety of oils but now with their Vitality line you can confidently use them to cook and bake with as well as flavor your water with the assurance of no added anything! I like that! I’m all for a healthier lifestyle! Email me and I can tell you more…..
I’m just wondering how many cookies come out from the listed ingredients you have. I’m going to attempt these for a Christmas party! Thank you! The recipe will make about 24 cookies. Happy Baking!! Just made these today to bring for Thanksgiving but need to make another batch (or two!) because my husband and I ate almost all of them! Sooooo yummy! Thanks for sharing this recipe! Oh my goodness you are cracking me up. Thank you so much. Hi read through all the comments. Mine are in the oven but I didn’t really get a dough more a gooey cake mix. Did my best but they have gone flat in the oven. What did I miss? The mixture tastes great from the bowl though! Sorry to hear that Trudy. Did you refrigerate them for a while and roll them in balls? These turned out delicious! Thanks for the recipe! Satisfied my lemon craving I always have during the holidays. Fantastic. I am glad that you like them. I hope you have a wonderful holiday!!! I am making these for a holiday cookie exchange and I will be making almost 10 dozen. Can you double up the ingredients in this recipe? Yes you can. Happy baking!! How come no one ever tells how many cookies this recipe makes? It makes about 24 cookies. Happy Baking! Do you use salted butter for this recipe? why would the first step be to pre-heat the oven, when you then go onto chill the dough for 2 hours? Made these tonight, I added a tad extra zest and lemon juice. Didn’t add the extra powdered sugar at the end. Turned out great, light fluffy & lemon-yy! However, I would of liked a bit more of a lemon flavour so may have to read the comments again and see what others did to enhance the lemon. I made these again last night for a holiday cookie exchange and got started late, and was making 3 batches. i did not chill for 2 hours, instead i loaded the batter into a large ziplock bag and clipped the bottom of one corner to use like a pastry bag, it allowed me to get cookies onto the cookie sheet faster. Then sprinkled powdered sugar as they cooled. I also used double the amount of lemon rind and 3- 4 tablespoons of lemon juice and everyone loved them. Great easy recipe! thank you! You are most welcome. Thanks so much for the information. Sometimes all you need is a determined woman in a hurry. LOL!! I was wondering how they would hold up with more lemon juice and I just have not had the time to remake them with more juice and zest. Thanks so much!! Me too!! I love limes too! Will the cookies bake OK without using parchment paper? Yes they will. Use a nonstick cookie sheet. Do you have a good recipe for a lemon icing. Also, recipe for a lemon glaze. Will your Lemon Gooey Butter Cookie hold up to either icing or glaze?? Maybe a glaze. I don’t think they would hold up to an icing. I do not have a lemon glaze recipe but you could easily google one. Not hard at all.. Lemon juice, powdered sugar, lemon zest. Super easy! Do you have a lemon icing for the cookies? A little change from powdered sugar sprinkled on???? Just made these for an elderly friend who loves lemon. I only got 19 cookies from this recipe, as I the rest before baking. My bad. Added tad more juice plus 1tsp of lemon extract. Delish!! Thanks for the heads up!! I hope your friend enjoys them. I can’t find lemon cake mix just supreme lemon bar mix. Will that work if I use both packets together? Sorry I am not familiar. Can you freeze prior to baking, so I can bake fresh later? Yes I think you could. I have never tried. If you decide to please let us know how they turn out. Best cookies ever. My daughters 4th grade class loved them. Easy to make. Easier to eat! Hey Mary Jo! I am so glad that your daughters class loved them. Such a sweet comment. You made my day! Can I freeze the dough and bake later? If so, must I wait for them to thaw? I have never frozen this dough and I am hesitant on it. I don’t think that I would. Lets see if the readers have a different response. Are the cookies a tart lemon or sweet lemon taste? As a St. Louis native living in Hawaii, these remind me of home. I made these tonight. I did add Tbs of lemon extract and a tsp of lemon zest to mine. May have to make a Gooey Butter cakeas well. Awesome! So glad that you liked them and that you adjusted them to your taste! If I don’t freeze these, how long do they last? Is it the standard 2-3 days, or do they hold up a little longer? It has been a while since I have made those. Maybe a little longer than that. I would say 4-5 days but like I said it has been a while. So many things to make and so little time.